I made this Spicy Hamburger Goulash one night for my parents because they were watching Annie while I had a workshop close to their house…..they said it was too spicy. Annie wouldn’t eat it. She said it was “hot.” Barry and I thought it was just right…..and I didn’t even need a hanky. If you don’t want it spicy, you can just cut back on the amount of chili powder. 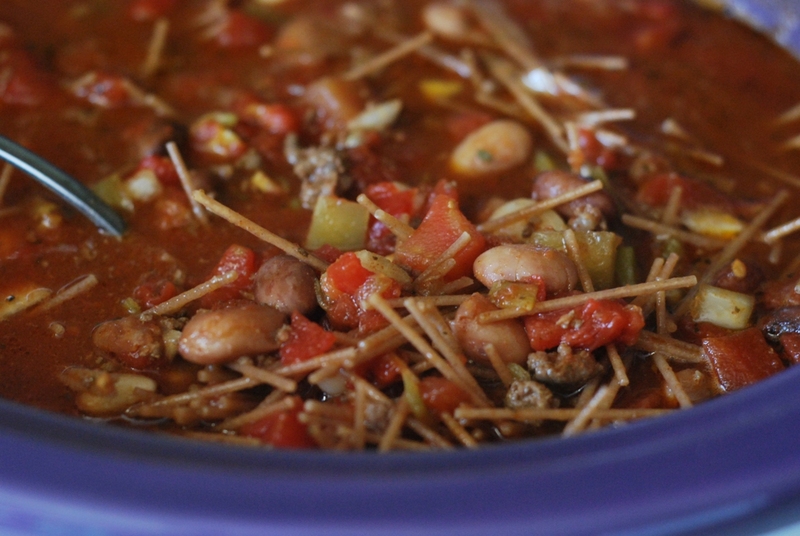 This is a very versatile recipe because you can vary the spices and beans as you like. You could even add corn if you want to. My parents are pansies when it comes to hot food – but I love them anyway. Brown a pound of hamburger (or venison) in a skillet. When it’s done, transfer it to your crock pot. Stir in canned tomatoes, pinto beans, navy beans, water, chopped onion, chopped green pepper, chili powder, Worcestershire sauce, beef bouillon granules, basil, cumin, and white pepper. You most likely won’t need to add salt unless you used no-salt-added tomatoes. Cover and cook on low for 5 hours. I really need to get a timer that hangs around my neck. For some reason, I forget things in the crock pot. It’s not like they make the whole house smell delicious…..it’s not like it sits on the counter right in front of me. I mean, it’s SO easy to forget I’m using it. *Cough* Anyway, 5 hours later take the lid off and add your noodles. Usually Goulash has elbow macaroni in it…..but I didn’t have any. I only had spelt spaghetti noodles, so that’s what I used. I just broke them into small pieces and stirred them in. They look sorta funny in there……like hay. Cover it back up and let them cook for another 30 minutes. Or maybe an hour. Uhhhh, who’s counting? Gotta look into that timer. When your noodles are done, the Goulash is ready to eat. It’s basically like a vegetable beef soup but with less liquid. It would be really delicious if you ate it by scooping up bites with tortilla chips……or if you ladled it over a big piece of cornbread. My belly is growling. These food posts just make me want to eat. Am I the only one having that problem? This is even better the next day, when you bring it home to eat yourself because your parents are pansies. That’s okay….more for me. Brown your hamburger in a skillet. Transfer to a greased crock. Stir in tomatoes, chilies, beans, onion, green pepper, chili powder, cumin, Worcestershire, beef bouillon, basil, and white pepper. Cover and cook on low for five hours. Stir in broken up noodles. Return lid and cook an additional 30 minutes or until noodles are tender. THM Compliant: This is an E meal if using lean ground turkey for the meat. I’ve made this Goulash a couple of times and I just had to come back to your Blog to say how delicious it is. I halve the recipe because there’s just the two of us and it still makes enough for to full meals for us plus some left over for me to eat for lunch one day. It’s as good or better on the second day and we’re never sorry to have to eat it two days in a row. Thanks so much for sharing this recipe with us and the world. This is totally a matter of preference! I like the beans drained and rinsed because I don’t like the liquid in the beans. But the recipe works great either way. Thanks Trish! So I’m really confused now. I’m German and Goulash, whether the German or Hungarian version, doesn’t contain beans or macaroni. Is this an American version? Ha ha! 🙂 It must be – it’s the versions I’ve always seen in Southern church cookbooks. 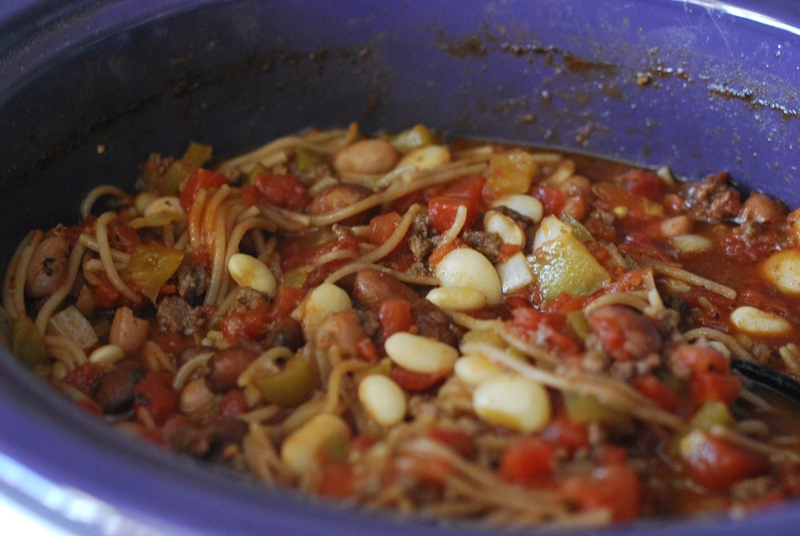 i’ve made this for years but never thought about doing it in the crockpot! I must apologize. I was quite convinced you were crazy when you thought noodles could cook in the crockpot for 1/2 an hour. I mean, really? I’ve never seen a recipe like that before! I’ve always had to make at least a starch on the side for this type of recipe. But, out of desperation I decided to try it. I was going to blame you for ruining my whole meal. But, alas. What a miracle. The noodles cooked! 🙂 This was very yummy and I made it for dinner last night as I didn’t have hardly any time yesterday, even to cook a separate pot of noodles. I liked the addition of the beans! I did have to top mine with sour cream as it was too spicy, even with 1 1/2 TBSP of chili powder. Thanks for the conversion. LOL I’m a believer now. I’d actually love to hear you talking , like what you sound like. You make me laugh! Not at ya but with ya! Ha! I have a few videos…I try to post them occasionally. Here’s one about my crock pots. Really enjoyed this! I did add some water with the pasta, probably about 3/4 cup. I took your advice and added a can of corn and also one of tomato paste. 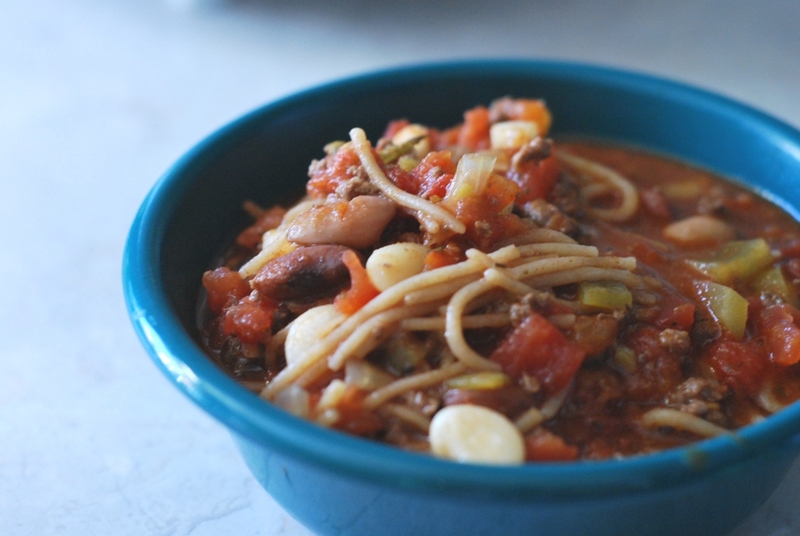 A wonderful hardy recipe that husband and I both loved and can eat throughout the week! Thanks so much! I love dishes that I can cook once and eat for several meals! 🙂 Glad you liked it! You always make me laugh. And you can always see me nodding my head agreeing with you. I need a timer. *nod* Yea, I forget too. *nod* Yea, parents are pansies *nod* …wait, no, no. I didn’t mean that.